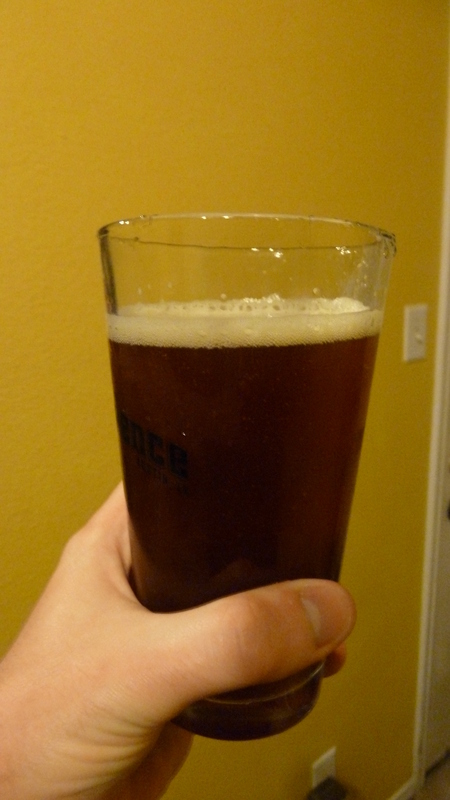 One of my first Partial-Mash homebrews was an American-style Red IPA. It was my first big beer, which I called #7, since it was 7% ABV. I was experimenting with hop blends, this one being a 50/50 mix of Centennial and Tettnang hops. The idea was to try to get a strong floral aroma by combining hops with floral components. Instead, this beer ended up having a very spicy aroma and flavor when fermented with Wyeast 1056 American Ale, but the final result was still very tasty. Looking through my homebrew archives, I found a few bottles of this Red IPA left, now dating over two years in age. Pouring into a pint glass, this beer has a nice, deep red appearance with an off-white head. The intense hop aroma is now faded, replaced by a mellow dark fruit aroma (on the black cherry spectrum) with hints of toast and grain husk. Similar to the aroma, no longer is there a spicy hop presence with strong bitterness, instead a raisin-y, toasty, cracker-y malt character. The two-year old body was on the thin side, but I can’t recall if this one had a bigger body to start with, probably a sign of its age. Overall, I am pleased with how well this beer has held up over time, giving my long-term sanitization practices a confidence boost. Also, surprisingly, after two years, this bottle had very little oxidation apparent in both flavor and aroma. The recipe for this beer is posted below, although, if I was brewing a Red IPA today, I would definitely change it up, likely adding some Munich malt (~5%) and using only a lower crystal, like 20, 40 L to keep the dark fruit character low. Also, I would probably stick to a citrus-forward hop, like Cascade or Centennial to cut through all the maltiness.